Albino hamsters have white hair all over the body, pale pink skin and blood-red or pink eyes. Non-albino white hamsters not only have dark eyes, but often have pale tan or yellow patches on their coats. The winter white dwarf hamster is not an albino. This dwarf hamster becomes white in the winter, but usually has dark eyes and a silver stripe down its back. Albino Syrian hamsters were discovered in the 1950s while albino Russian dwarfs were not discovered until 1988, according to Hamsters.co.uk. Some albino hamsters are born without eyes and only live to be a year old, instead of the usual two to three years, according to the UK Hamster Society. These hamsters, discovered in the late 1950s are known as anopthalmalic whites. Red eyes can appear in many other Syrian or teddy bear hamster colors, not just albinos. 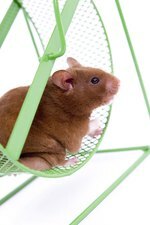 It is unknown if red-eyed hamsters have worse vision than dark-eyed, since all hamsters have poor vision, according to Darwin Veterinary Care. Poll: Guinea Pigs or Hamsters?